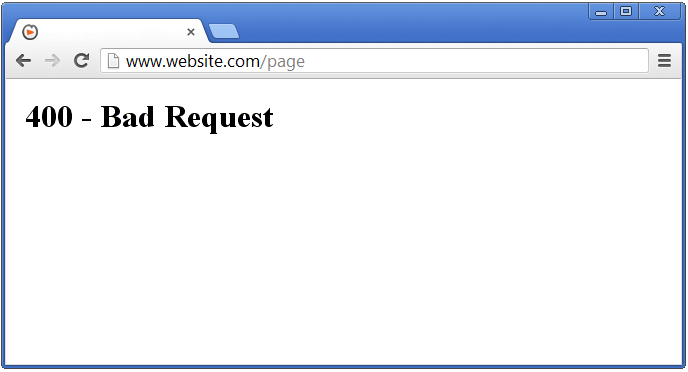 The 400 Bad Request error is one of the more common HTTP status codes that you will encounter. It basically means that the server does not understand the request that you are making to it. The wording of the error is different depending on the web server you are trying to connect to. You will see this error inside your browser in the same place you would see the expected web page. It does not appear as a system popup coming from your computer. The main cause of the error is entering the incorrect address in the address bar of the browser. This could be from typing it in incorrectly or pasting in a url that is incorrect. Check for typos in the URL you entered. This is the most common cause of the 400 Bad Request error. It could be that you typed the error in the address bar. If you pasted in a url that you swear is correct then you may want to check for extra spaces or characters that you may have picked up when copying the url. If you keep getting errors, then you may want to clear the cookies in your browser. You may have some outdated DNS records stored on your machine that are leading you to the wrong place. Therefore, you may want to clear your DNS cache if the problem persists. Clear your browser’s cache if you keep encountering the error. It could be that you have visited the page before and your browser has cached an incorrect version of the page. This is not a common fix for these types of errors, but since it is so easy to do, it is worth doing to be thorough. That is pretty much all you can do on your end to fix the 400 Bad Request Error. If the problem keeps occurring you are left with the prospect of contacting the web site owner or just waiting it out and seeing if it resolves itself. There may be a possibility that the owner is doing work on the website while you are trying to connect and the problem will be rectified later on.